New diagnostic tools are used to lower the negative appendectomy rate. The human appendix can be safely removed because it has lost its function of cellulose digestion as found in the herbivorous cecum of our primate ancestors. A negative appendectomy should be avoided though because the removal of a normal appendix is accompanied with considerable morbidity and costs. Further diagnostic tools are, therefore, needed if on clinical grounds there is doubt about the diagnosis appendicitis. There is much debate about what to do with a normal appendix found during diagnostic laparoscopy. Because in the large clinical studies false-negative laparoscopies are rare, it is safe to leave a normal appendix in place to avoid added morbidity and costs associated with the removal of normal appendix. Symptoms mimicking appendicitis are probably due to self-limiting diseases. Care should be taken to not miss a diagnosis that needs further therapy such as carcinoid tumors which appear in 0.5% of the non-inflamed appendices. 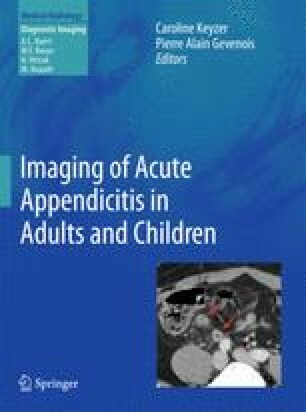 During long-term follow the chance of developing appendicitis appears to be no higher than in a normal population. So there can be no rational reason for a “prophylactic appendectomy”.